Use the "Geometry" command to expand the player app to the screen each time you open it. 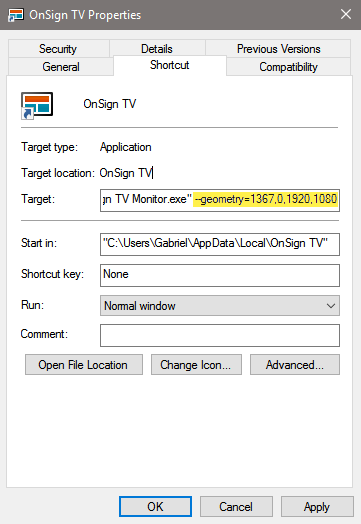 Open the OnSign TV App on your device. Right-click on the app’s background and select the “Toggle Frameless" mode. Close the window and then right-click the app icon on the desktop. Select “Properties”. The first two sets of numbers (X,Y) indicate where the top-left corner of the app begins, and the following two (L,H) define the desired resolution for the second screen or app. Now, each time you open the app it should display the exact location you set to occupy the predefined resolution.